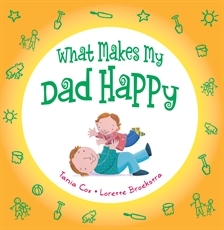 Children’s blog Good Reads with Rona has high praise for Tania Cox’s ‘charming’ children’s picture book ‘What Makes My Dad Happy’ (part of her series with Allen & Unwin). ‘this 24 page book will appeal to a broad audience since the dads depicted are from a wide range of ethnicities and abilities. I love that in addition to several Caucasian dads, a father in a wheelchair is shown along with an African-American dad, an older dad, and an Asian dad. Best of all, they’re having lots of fun and smiling loving smiles while interacting with their children’.